UPDATED: Mon., Dec. 3, 2018, 6:49 p.m. 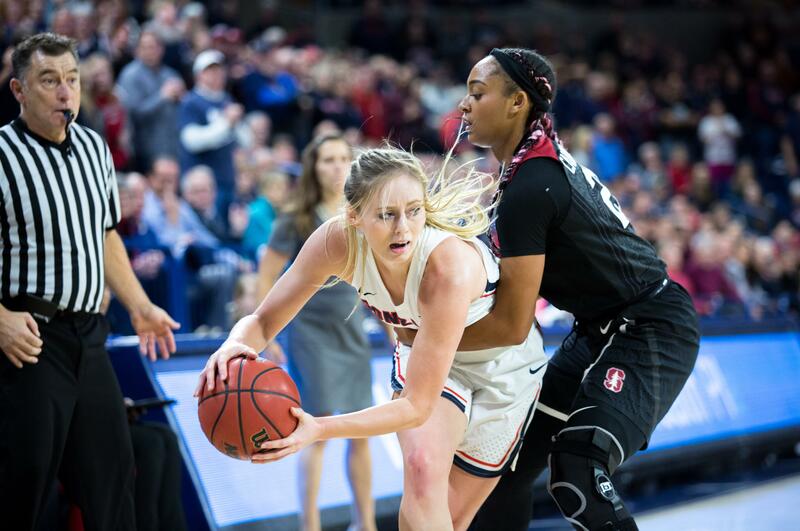 Beating Stanford on Sunday is already paying some big dividends for the Gonzaga women. Less than 24 hours after their epic 79-73 win over the eighth-ranked Cardinal, the Zags reaped a trifecta of rewards. They included a No. 24 ranking in Monday’s Associated Press poll, guard Chandler Smith’s first West Coast Conference Player of the Week award and a lofty 19th spot in the latest Rating Percentage Index. The latter reward might be the biggest come March. Keep this up and the 8-1 Zags could find themselves not only getting a decent NCAA Tournament seed, but hosting as well. It also gives them some armor plating to protect an NCAA at-large berth should they falter in the WCC postseason tournament. No one was talking about that on Sunday, after a game that saw Gonzaga take an 18-point lead late in the third quarter, only to see it shrink to three with two minutes left. But the Cardinal got no closer, thanks to some clutch play from Smith and Jill Townsend, who grew up on adjacent ranches in Okanogan County. “Sometimes you have to prod them with a cattle prod, something they’re very familiar with,” coach Lisa Fortier said after the game. Both players did a little of everything against Stanford. Townsend found the range in the first half, and also with a momentum-turning 3-pointer that restored a six-point lead with two minutes left. She finished with 15 points. “I told the players that I was more proud of their fourth quarter than the first two quarters, just because of the adversity,” Fortier said. Smith scored a game-high 20 points, four of them coming in the last 13 seconds. She also showed courage in the paint, drawing fouls and going 8 for 9 at the line. Moments later, they secured the biggest collegiate win for either of them, two girls from rural Washington getting the better of the top program in the West. “We knew that we were the underdogs,” Smith said. Not any longer. On Sunday at the Kennel, the Zags face Washington State, which is 4-4 under new coach Kamie Ethridge but has 13-point losses to UC Davis and Cal State Northridge. GU’s final nonconference game is Dec. 20 against Idaho, which is 3-3 and lost 115-71 at Stanford last month. The WCC schedule begins a week later. The preseason favorite Zags strengthened their reputation further on Sunday, though the conference is off to an uncommonly good start this year with a collective record of 48-21. “Now we have to move forward, but this is going to be nice to look back on,” said Smith. Published: Dec. 3, 2018, 5:28 p.m. Updated: Dec. 3, 2018, 6:49 p.m.